This article provides an explanation of our affiliate program via Refersion and provides instructions on how to sign up as an affiliate. Question: Does Freedom have an affiliate program? You can also find links to the affiliate program on your Freedom profile. 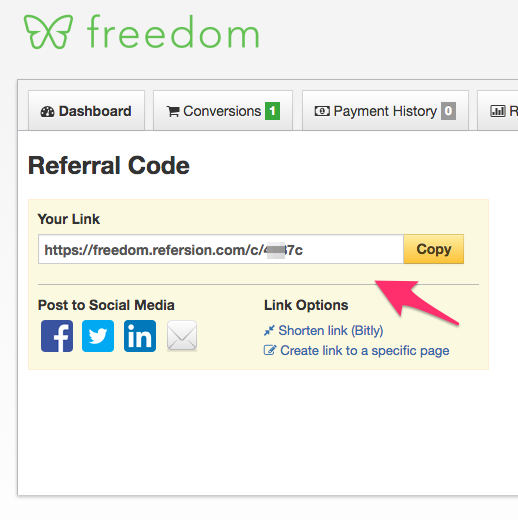 Once you have created an account in Refersion, you'll find your custom Freedom affiliate link on your dashboard. Share and promote this link to receive credit for account upgrades. Affiliate terms and offers are available in your Refersion dashboard, and will vary with our promotions. If you've got any questions, shoot us a line at support@freedom.to, or click the little green chat bubble inside Freedom.